This entry was posted in Categorie on December 12, 2015 by HeyQuim. “When you discover that you contain within you information that you can use to guide yourselves and to serve others, then it would be of benefit to you to look within for your answers, for your guidance, for anything that you seek. It can all be found within you. You are like giant storage devices with trillions of cells, each of which contain their own history, their own unique information. And this information pertains to not only you, not only your genetic line, but also all of the other beings who have ever been incarnate on this planet. It will be so beneficial for you to discover that when you desire to know something, you instantaneously know it and that you do not really need to seek information from other sources. However, if that is something that you want to do, if that is something that you desire in your life, then by all means look for other perspectives. That can be a fun endeavor. But you are a self-contained, self-sustaining unit. So there cannot possibly be something that would exist outside of you that would be of more benefit to you than the guidance that exists within you. So we are advocating that you decide that you are the ones who are your best guides and that you give yourself permission to crack your own codes, to enlighten yourselves, and to access everything that you need to access to live happily ever after. There is no better source of information than the being that is desiring that information. Because, you see, the question and the answer are like two sides of the same coin. And so, of course, if you have one side of the coin, you must have the other side as well. 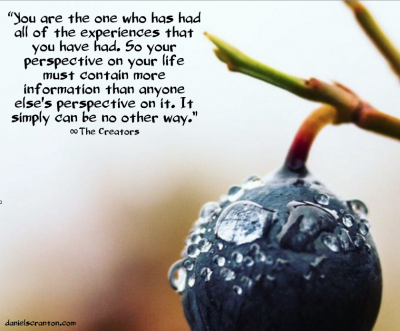 Now, take into consideration the fact that you are the one who is living your life, and you are the one who has had all of the experiences that you have had. So your perspective on your life must contain more information than anyone else’s perspective on it. It simply can be no other way. You may be in denial, and that may prevent you from knowing something or seeing something from the perspective of another. And you can always tell what you are in most denial about by what really stirs you up, what causes you to constrict yourself and to access resistance. Whenever you find yourself in that state, ask yourself if you are in denial about whatever it is that is before you, whatever it is you are hearing. And above all else, be willing to trust yourselves, to know that if you are getting something, that even though it is coming from you, it is still what you are getting. There is nothing random about anything that you receive, or that you experience, or that you come across in this lifetime. Not a single moment of it is unplanned and un-orchestrated. This entry was posted in Categorie on November 21, 2015 by HeyQuim. This entry was posted in Categorie and tagged consciousness, Expand, growth, spiritual on September 17, 2015 by HeyQuim. Enjoy! <3 :D ~ Click on the DATE link below! Happy 4th! This entry was posted in Categorie on July 4, 2015 by HeyQuim. This entry was posted in Categorie on June 19, 2015 by HeyQuim. This entry was posted in Categorie on March 3, 2013 by HeyQuim.